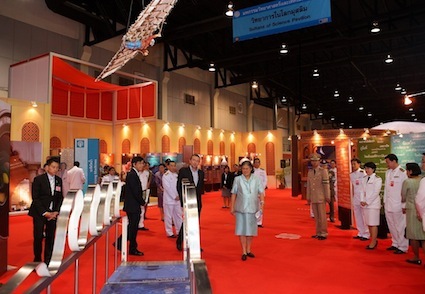 Her Royal Highness Princess Maha Chakri Sirindhorn graciously presided over the opening ceremony of the UAE exhibition ‘Sultans of Science’ which recently opened at “National Science and Technology Fair 2012”, the nation’s largest exposition on science and technology in Thailand at Bangkok International Trade and Exhibition Centre (BITEC). Over 1.2 million people visited the global travelling exhibition ‘Sultans of Science’ also known as ‘Islamic Science Rediscovered’ during its recent showcase in Bangkok which was organized by the National Science Museum – during the 2012 Fair at BITEC. Also present at the opening were Dr. Plodprasop Suraswadi, Thailand Minister of Science and Technology, Dr. Pichai Sonchaeng, President of National Science Museum, Mr. Thanakorn Palachai, Vice President of the National Science Museum and Exhibition creator Ludo Verheyen, CEO of MTE Studios of Dubai U.A.E. “The exhibition was a great success at BITEC and we look forward to the grand opening of “Sultans of Science” at National Science Museum soon”, added Sonchaeng. After the huge success at BITEC which was a soft opening during the “National Science and Technology Fair 2012”, ‘Sultans of Science’ will open at National Science Museum in Thailand on 11th September to run until mid of November 2012. Currently touring Asia, the exhibition after concluding in Thailand will be hosted in Malaysia at The Petrosains Discovery Science Centre. Making its Asian premiere at the Science Centre Singapore, it has attracted massive response from people of different faiths and religion in the region. Commenting on the success of the exhibition Ludo Verheyen, CEO, MTE Studios said, “We are honored that our ‘Sultans of Science’ exhibition was hosted at the “National Science and Technology Fair 2012”, nation’s largest exposition on science and technology.” “We are overwhelmed with the enormous success of the exhibition at BITEC where over 1.2 million people visited just in two weeks. The global travelling exhibition brings one of the world’s most pioneering civilizations to life, an incredible exhibition that boldly underlines the remarkable contributions of Muslim scholars from the Golden Age of Islam (700 – 1700 CE) in science and technology. The display at National Science Museum will surprise the visitors on how thinkers from this era influenced modern medicine, mathematics, astronomy and many more. The dawn of the Islamic Golden Age in the 7th century was profoundly inspired by the instruction to seek and share knowledge. MTE studios brings this history to life with more than 50 multi-media exhibits highlighting how Muslims worked harmoniously alongside people of different faiths and races across Africa, Asia and Europe. The blockbuster exhibition covers the main fields of Islamic scientific endeavor including architecture, arts, astronomy, engineering, exploration, flight, mathematics, medicine, optics and water control in a beautifully designed on a journey back through time. ‘Sultans of Science’ global tour started with New Jersey and since then, it has enjoyed huge success at various North American venues.